We make self storage easy. Pay deposit and 1st month's rent. Get your personal storage unit. At Business Park Storage, we offer storage, service, and solutions sure to exceed your expectations. 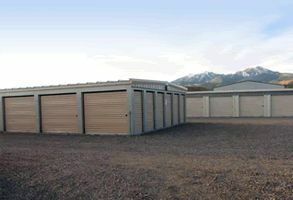 Call us at 406-220-1170 for more information on our storage services or visit us at 7 Business Park Road Livingston MT 59047.
Business Park Storage is locally owned and operated By Melvin and Kaley Schuman. We continually work to enhance our business by applying our customer service, best practices and management expertise. Business Park Storage was originated and built in 2006, as the needs have grown; we have added storage buildings on the property expanding our available units to over 365 storage units, 45 RV spaces, and 9 commercial units. We built on the idea to provide a great service focused on ownership, operation, and development of Business Park Storage in Livingston MT. Our self-storage facility is designed to offer affordable, easily accessible and secure storage space for residential and commercial customers. "We love the easy access"
"Cameras and surveillance is nice to have"
"Convenient location, accessible day or night"
"Appreciate the More than adequate customer service"
"Top Notch, Nicest Facility in the region"